Luke and Kim Alikanavitch (left) and Todd and Paula Piercy battled for the Kennett Square Platform Tennis Mixed Doubles title. 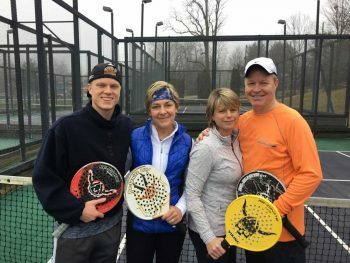 EAST MARLBOROUGH — On January 21st, Kennett Square Golf and Country Club held the mixed doubles Club Championships for Platform Tennis. Also referred to as paddle most of the time, the game is an addictive outside sport that allows you to hit a ball and take it off the screens and try to win a point with patience and skill. For the second year in a row the team of Mother/Son Kim Alikanavitch and Luke A. won the club championships at KSGCC.com. 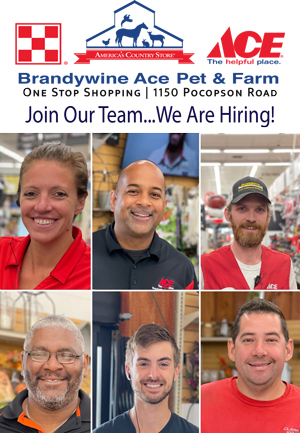 Luke Alikanavitch is a former baseball and basketball player from Kennett High School, and a pitcher who played for four years at University of Delaware. Also a former Blue Hen is his mother whom he played with and won with last Saturday at Ksgcc.com. The Alikanvitch team won over local Kennett residents Todd and Paula Piercy. Todd and Paula are tennis players and paddle players who have a love for the game. It was a fun filled day with lots of great matches. The weather was cooperative with no sun, which can cause issues, and cool temperatures. Paddle is played in all weather including rain and snow. 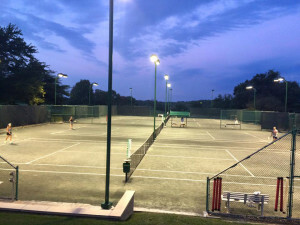 Kennett has propane heaters to dry off the courts when wet or icy. John and Simone Twombly, a husband wife team were defeated by local real estate agents and partners, Tom O’Neill and Lynn Hinckley. In 5th and 6th place were Hannah and Eric Christopher who won over local jockey Walter Puddifier and his partner Suzy Hughes. Rounding up 7th and 8th place were Bob and Donna Smith ; winners over Gigi and Spencer Slattery.